In Seattle to stage Kylian’s “Forgotten Land” at Pacific Northwest Ballet, Anderson took part in PNB Lecture Series last week. Starting out in ballet in her native Australia, Anderson joined the Netherlands Dance Theater in 1972 “so I was there before Jiri,” she said. In 1975, the Czech choreographer became the artistic director of the company and, over the next three decades, created numerous works that became a standard part of the international dance repertoire. Set to Benjamin Britten’s “Sinfonia da Requiem,” Kylian’s "Forgotten Land" references the slow drowning of the land by the sea in Britten’s birthplace of East Anglia, loss always present in the lives of its inhabitants. In addition, the six couples evoke different stages of love experienced in tandem with the life lived between sea and solid ground, said Anderson. The set references the dark landscapes of Edvard Munch ("The Scream"). But when pressed by the mother of a young girl in the audience to explain the “story” of the ballet, Anderson told the aspiring eight-year-old dancer to simply watch and create her own interpretation of what she sees. 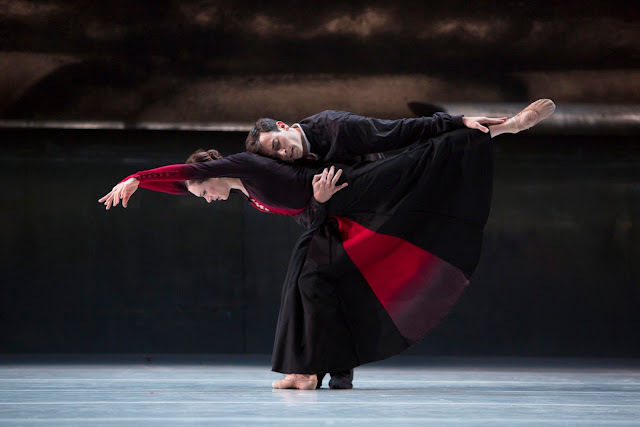 PNB has matched this presentation of “Forgotten Land” with another meditation on love, Twyla Tharp’s cheekily named “Brief Fling.” Even Balanchine’s “Stravinksy Violin Concerto” which concludes the evening can be seen as a commentary on the relationships forged from passion. The program, also titled “Brief Fling,” continues through this weekend. For more on tickets and times, see the PNB website. Pacific Northwest Ballet principal dancers Rachel Foster and Jerome Tisserand in Jiri Kylian’s "Forgotten Land," which PNB is presenting as part of BRIEF FLING. Photo © Angela Sterling.